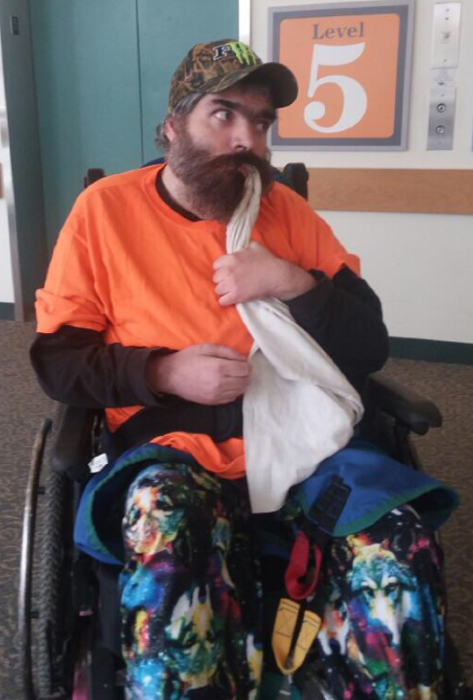 St. Johnsbury, VT: Chad Everett “Buckie” Young, age 37, passed away at his home surrounded by his family Monday morning, March, 18, 2019, after a long battle with respiratory problems. Chad was born in Hanover, NH, on September 27, 1981. He was raised and educated in St. Johnsbury graduating from the Academy in 2002, and was a lifelong resident. Chad was a joker and liked to knock things over and make noise. He enjoyed going on car rides with the family especially taking along the niece and nephew. Trips to Fryeburg Fair, Canobie Lake Park, truck pulls at any fairgrounds and camping in the summer were always big hits. He liked going to Riverside Life Enrichment Center and one of his favorites there was Shayanne, but he had many, many friends there. In Chad’s words “Thank you Dr. Price for all you did for me, you were great. Thank you Heather and Eric and everyone else too”. Survivors include his mother, Lois Young and step-father, Walter Seligman, both of St. Johnsbury; his sister: Alyssa Young of Franklin, NH; 2 brothers: Elvis Stuart (Lisa Spinner) and Patrick Young (Megan) all of St. Johnsbury; niece and nephew: Morgan & Logan Stuart; and many aunts, uncles and cousins. He was predeceased by a brother: Chavis Young in 1991 and his maternal grandparents: Donald Young, Sr. in 1971 and Clara Young in 2004. Services will be held at 12Noon on Saturday March 23rd at the First Congregational Church of St. Johnsbury Center, 1869 Breezy Hill Road with the Rev. Dr. Jeff Potter and John Sleeper officiating. Friends may call on the family for memorial visitation at the church from 10AM until the hour of service. Burial will take place at a later date. The family would like to thank all those that contributed towards Chad's funeral expenses, everything is paid in full. Thank you for all your prayers and support.